Gifts with a difference from..I Just Love It! Once in a while, I get to review things that are for grown-ups too! I am very excited to bring to your attention I Just Love It today, an online haven which could be described at the epitome of quality personalised gifting! Formerly known as Gone Digging, the shop retails the most impressive collection of personalised gifts, suitable for 0 to 99 year olds. personalised craft beer for Alex. Not only do you get to put the lucky person’s name on the label, you can also add a message of your choice on it, to make it even more personal. Mine was “Beauty is in the eye of the beer holder”, to reflect Alex’s recent preference for good quality, craft beer. The labels were a very well received surprise and the beer did not disappoint either! Alex wants to order now for his male friends and surprise them when they come over for a meal! 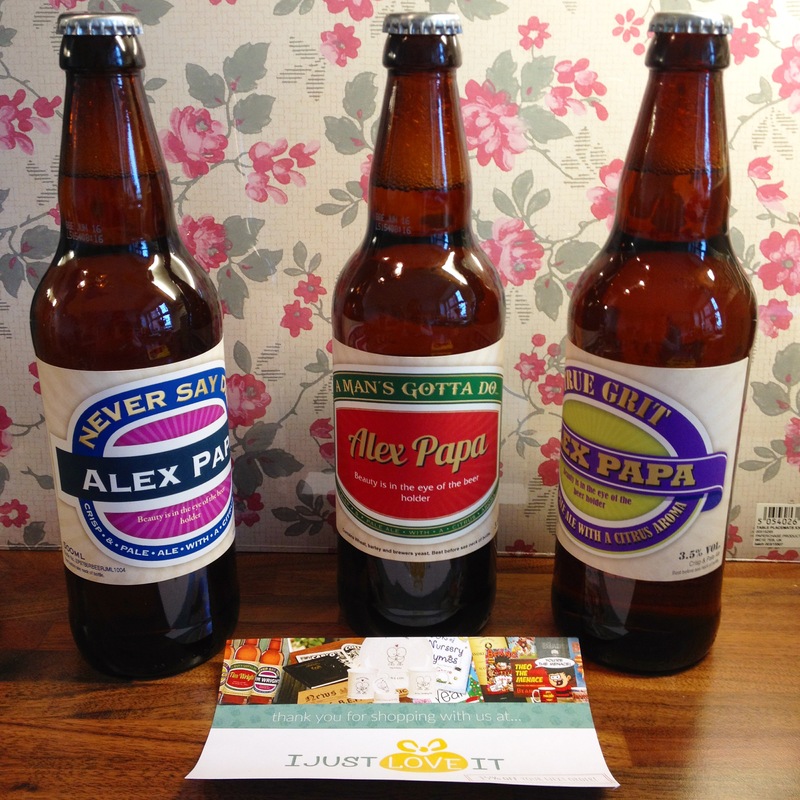 The three personalised beer bottles retail at £9.99 on the website, very reasonably priced, in my opinion, given the extras! Both Alex and myself are coffee drinkers and can go through gallons of the stuff each day so the next gift had to be related to our daily habit! The next gifts were chosen to reflect our personality in a mug, so to say, and with me fancying myself a writer and Alex constantly being at the local gym, the choice was clear! A cup of tea(or coffee) has to always be accompanied by a matching coaster, so when I saw that the website provides them, I had to add them to the shopping basket too! Don’t they look the part and don’t they match perfectly our coffee mugs? If you got jealous, head over to the website. The mugs retail at £7.99 each and the classy Victoriana coaster set, which has replaced the shabby and well worn out ones we had in the kitchen, retail at £6.99. Emma was not forgotten and the two last gifts I chose were for her. 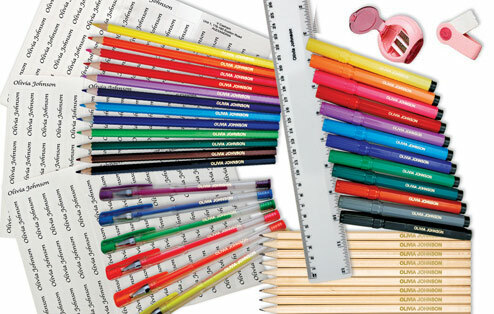 One was the practical, personalised gift of labelled colouring pencils. Her school has asked us this year to send in pencils labeled individually so this set would save any busy parent the painstaking task of sticking labels on a whole set of pencils. The 20 colouring pencil set we ordered retails at £8.99. The website has a whole variety of personalised school stationery and the best value for money would be, in my humble opinion, their 145-piece personalised stationery set, which includes on top of personalised rulers, pencils and markers 100 personalised name labels! And all for £23.99! 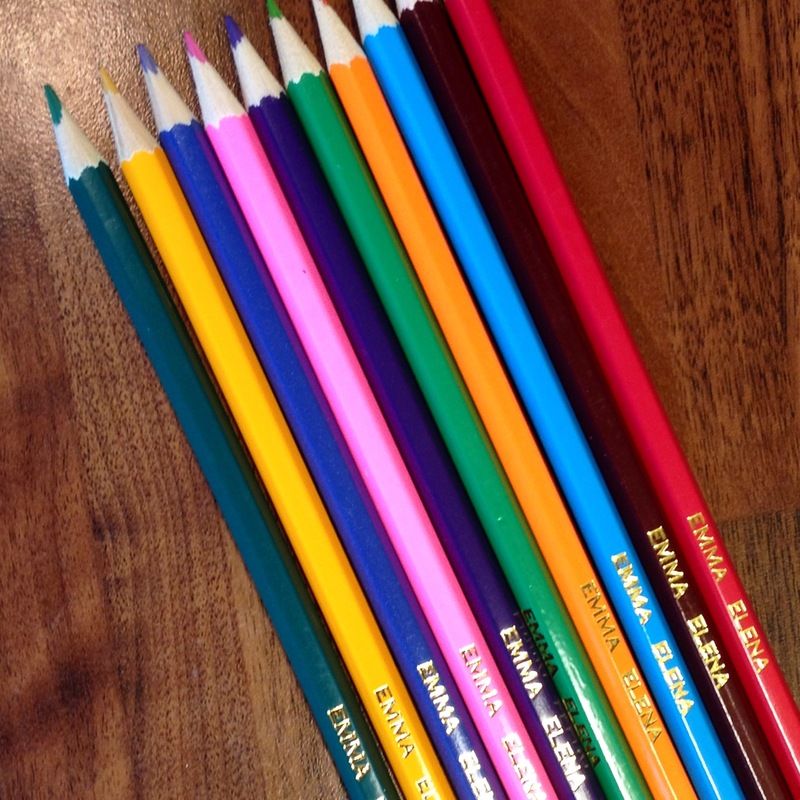 Next summer, I know where I am going to order Emma her personalised school stationery set! 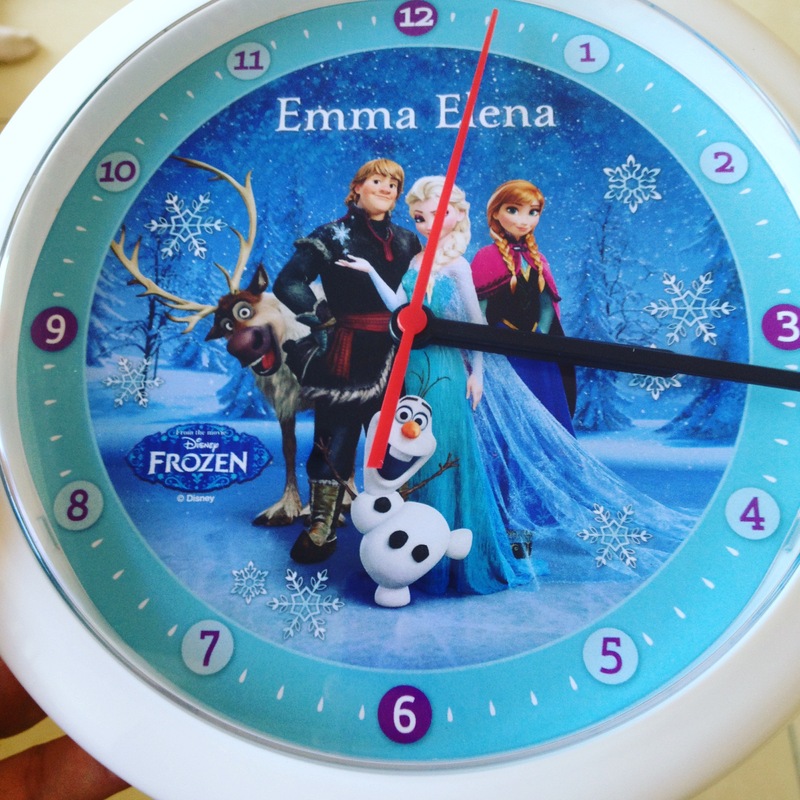 Last to arrive but, by far, Emma’s favourite item from the website was her personalised Frozen clock! Emma is soon to be 6 and very interested in learning about time so this seemed like the logical choice of present for her room. My only advice is, if you consider buying your little one a personalised present from I Just Love It, is to check dispatch time frames. Emma’s clock took two weeks to arrive, as the website did inform us it would, when we ordered so do leave plenty of time for the presents to arrive, to avoid delivery stress and disappointment. The clock retails at £14.99, is silent so can be used even inside the room of very light sleepers, very light and makes a beautiful addition to any Disney princess fan room! The company wants to extend kindness to my readers and is offering a 15% discount on all purchases, with the code Thanks15. Do you used gift shops to purchase presents for your loved ones on special occasions and which of the products above would you choose for yourself or your family? Disclaimer: we were sent vouchers to purchase products on the website for the purpose of this review. As always, the opinions expressed are entirely our own. I love these. Bookmarking this for Christmas! 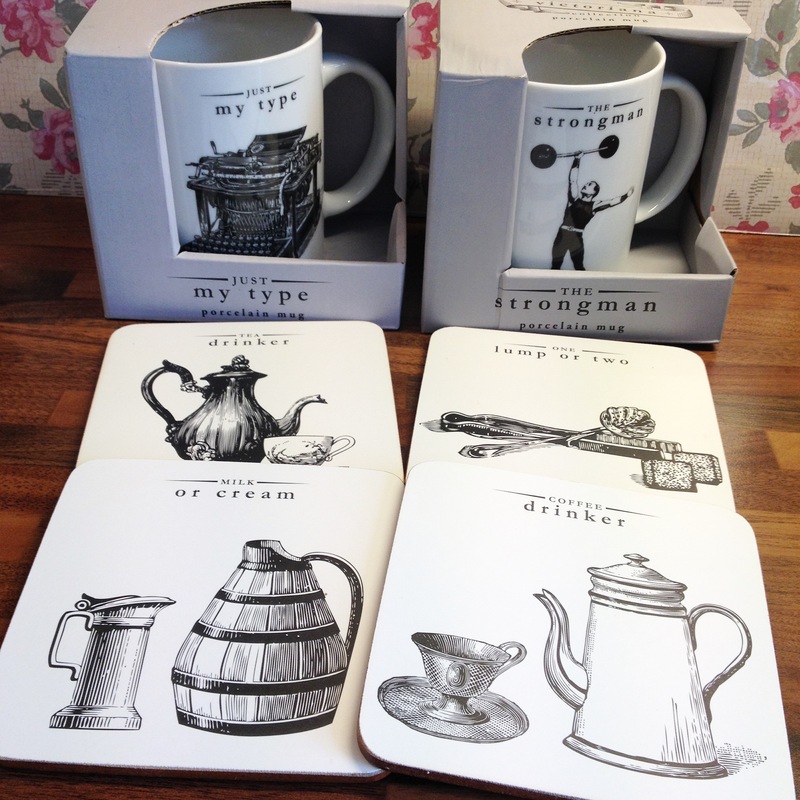 What lovely gifts, I like the mugs and the pencils especially just lovely.